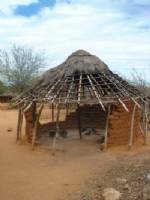 Ikathima is a nursery / primary school in a remote and arid area on the border of Kora National Park. There are 186 students – 81 girls and 105 boys. The population has been higher, but went down at first due to bandits (shiftas) and lately due to the search for food following the long drought. The school had a feeding programme for all the students which helped to attract and retain students in school, but this has now been discontinued by the World Food Programme. There are 9 classrooms -all except 2 were in very poor condition, with dirt floors and no doors or windows. These are now being re-furbished by TAS. The school has 15 acres of land. There are some water tanks - not all of them connected to the roofs - but these have long been empty. The recent drought has been a great hardship for the community who had to fetch water from a well some distance from the school and carry it to the school on donkey carts. Now however trustees have succeeded in getting a nearby disused bore hole re-furbished so the water situation is much improved. There are three staff houses but these are tiny empty mud huts with grass roofs and holes in the walls and roofs. The HT said he sometimes sleeps in one. The other two have no doors. Priorities for funding include refurbishment of the classrooms, a new kitchen, additional teachers so the parents dont have to pay fees, solar power and maybe in the long term the provision of boarding facilities for the many students who come from very far. These projects have all been completed and TAS is withdrawing its major funding. There are new classrooms, shade bandas, a fence, garden, trees, dormitories, staff houses, solar power, kitchen and much more. The local trust continues to operate with some local fund raising being undertaken. The school roll has increased to 354 -156 boys and 198 girls. This year 21 students achieved high enough marks to go on to secondary school compared to 3 in 2009.